If given the chance to visit a place in the Philippines besides Manila, K-pop rock band CNBLUE said they want to visit Cebu, which has become a popular destination for Korean tourists and celebrities. "Cebu [for] fishing," said 21-year-old Jungshin. The boy band talked about their music and concert as they rocked SM Megamall during their press conference on June 14. Fans patiently waited for hours and packed the mall's activity center just to see CNBLUE's Yonghwa, Jong-hyun, Yungshin and Minhyuk, who are scheduled to hold their concert, titled "Blue Moon: 2013 CNBLUE World Tour," tonight at Araneta Coliseum. Before the arrival of CNBLUE, games were played by fans and concert tickets, courtesy of Pulp World Live, were awarded as prizes. Deafening shouts and cheers from the fans enveloped the area from the time CNBLUE arrived until the press conference ended. CNBLUE greeted their fans in Filipino. "Magandang hapon (Good afternoon)," said the boy band. "Ako si Jungshin (I'm Junghsin)," "Ako si Jong-hyun. Salamat (I'm Jong-hyun. Thank you)," "Ako si Yonghwa (I'm Yonghwa)," and "Ako si Minhyuk. Kamusta ka? (I'm Minhyuk. How are you?)" said each member of CNBLUE as they introduced themselves. "[We are] so very happy," said Yonghwa about the overwhelming number of fans who went to the press conference. Some fans came from other countries like Singapore, Thailand and Korea just to watch CNBLUE's concert in Manila. Fans welcomed CNBLUE at Ninoy Aquino International Airport Terminal 1 when the boys arrived on June 14. At SM Megamall, fans lined up outside before mall opened. Inside, the fans positioned themselves at the activity area and upper floors to make sure that they would witness the press conference. Asked which song he would dedicate to CNBLUE's Filipino fans, Yonghwa sang a line from their song "I'm Sorry," which is included in their fourth Korean mini-album "Re:BLUE" that was released last January. Asked if they have tried any Filipino food, the boys, who just arrived a few hours before the presscon, said they have not but urged the audience to suggest what food to eat. The hosts, Kring Elenzano and radio DJ Jinri Park, joined by TV entertainment reporter Gretchen Fullido, suggested "balut," the boiled duck embryo; "adobo," one of the popular dishes in the Philippines; and seafood. Yonghwa, who is celebrating his 24th birthday on June 22, was presented with a cake at the presscon and he thanked the fans for the surprise. Blue tinted roses were distributed to the media to wave when the cake was presented. 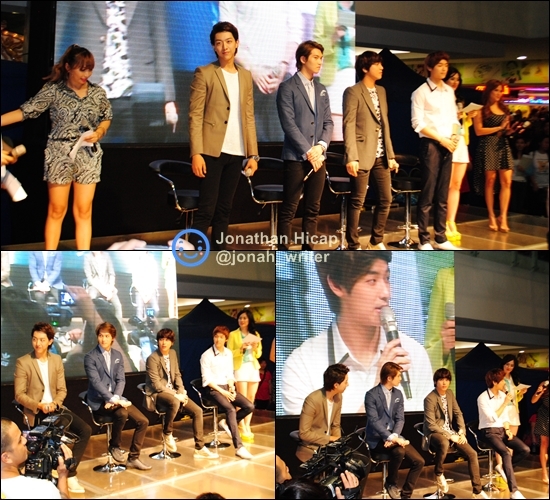 The press conference was organized by SM Megamall, Pulp Live World, FNC Entertainment and DOA Company.